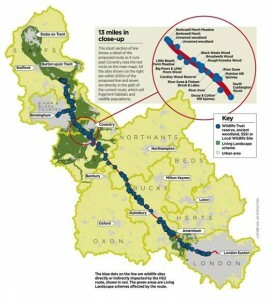 STOP HS2 | Government ignore more independent criticism of HS2. Government ignore more independent criticism of HS2. Today (18th June), the Government response to the recommendations of the Environmental Audit Committee (EAC) on HS2 has been published, and it will come as no surprise that, like the recommendations previously made by the Transport Select Committee and the Public Accounts Committee, the concerns of an independent group of MPs have been completely ignored. The nearest the Government came to accepting anything the Committee had said was about the suggestion to have an independent body to monitor the creation of off-set habitats, with the Government saying they will “consider further” the options for Natural England or local authorities having such a role. Rejected the call for a ring-fenced budget for environmental protection measures. Stuck by the calculations to be used on the ‘condition’ and ‘connectedness’ of ancient woodland, which will lower the amount of new woodland required, despite ancient woodlands being universally regarded as irreplaceable. Claimed that an appropriate baseline was developed to enable assessment to a sufficient level in the Environmental Statement, despite the fact that 40% of the route has not been surveyed. Ignored the concern of the committee that they had not distinguished clearly between ‘mitigation’ and ‘compensation’ measures in respect of biodiversity. Admitted that Natural England has additional information on woodlands, which was not incorporated into the Environmental Statement. Ignored the suggestion that HS2 Ltd should monitor all aspects of the environmental protections needed for HS2 for the 60 years, saying with some habitats “a five year period may be appropriate”. with Apologies to Cold Comfort Farm. This Goverment made an election pledge to be the Greenest Govt ever. Yet another piece of Cameron PR ploy,vacuous wordplay and quite the opposite actions … it was going to be the most transparent Govt too!. Instead we have Government by Stealth…..just where are those Garden Cities going to be built? In fact the Coalition have launched some of the most destructive policies regarding forestry, planning and transport and have become the biggest threat to the countryside and environment. This includes the Lib Dems. The impetus for HS2 has come from the vested interest groups and their lobbyists. The recession and mass migration = ‘housing need’ has ‘given permission’ for the most regressive attack on the environmental protection developed since the 1970s. The CEAC need to take the Ministers head on and make sure that their opinion is understood by MPs who also need to take heed. When there is a paradox in parliamentary democratic process I always advocate: Follow the money and identify the interests and their influences. The political classes, knowing better than us, have mortgaged our country to foreign investors and our kids will pay for it. Siemens have opened a factory here on a promise of some HS2 action and the Chinese have agreed to fund it (and other infrastructure and the dairy industry)because UK has no money. If it is cancelled the UK Government will look foolish and future investment will be prejudiced. The political classes will force it through to safeguard their own lifestyles and credibility.It is the only way Labour can provide unionised jobs for undereducated inner city dwellers and Cameron is only acting to promote the best interests of his city financier friends. End of. I should have clarified that the 0.0016%, reflected “whipping” of MPs of major parties, there is no “real” cross-party support. Many consider the EAC was considerate in addressing the oral witnesses. HS2 Higgins is a delivery hired person to deliver not a planner to get the proposition right and route changed. So the rejectionist policy of DFT and HS2 is of no surprise. There is a concern the NHS cannot obtain the £2B from HM Treasury but the presumption for Higgins is the HM Treasury will raise the Phase 1 £20B without delay. Is this likely or unlikely, myth or fact. Cameron and Clegg have no U turn room now and only Labour can change politically to suspend the progress. HS2 has become an unstoppable project. Who let the brakes off. Hoon Adonis and Sir David Rowlands started this project which has become the most divisive UK project since the Poll Tax. EAC were sensible in their report and incorporated the opinions of local people damaged by HS2 without one spade entering the ground. HS2 will find the people resist the proposal not only for direct damage to their lives but also for the attitude or beligerence and rejection of criticisms. Keep putting forth your opinions and views please. What else would you expect from this Govt. Cameron is no democrat, he doesn’t listen, you would have thought after the European elections…..The whole project stinks, I detect a whiff of a further PFI disaster in the offing, the Chinese will want their pound of flesh, it won’t come cheap. What pound of flesh and what is cheap? No, when they call “chicken!”, it won’t come cheap, it’ll come: “cheep, cheep!”.